Three days after the award ceremony in Paris, Meemann Chang was back in her office at Beijing’s Institute of Vertebrate Paleontology and Paleoanthropology (IVPP). She declined almost all interviews and invitations. It was as though nothing had happened. 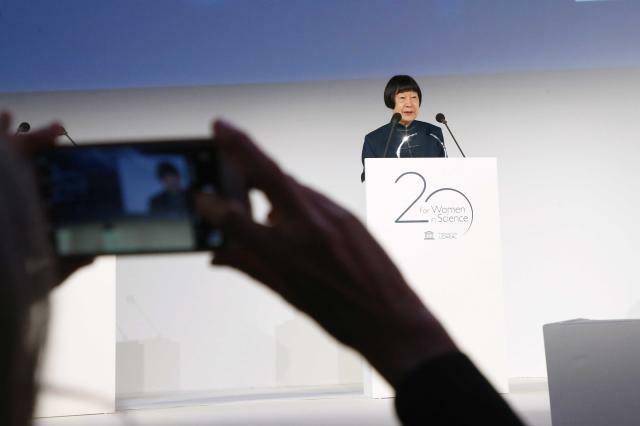 But on March 22, 2018, the 82-year-old paleontologist and evolutionary biologist was recognized at the L’Oréal-UNESCO For Women in Science Awards in Paris for her pioneering work on fossil records, which has led to insights on how aquatic vertebrates adapted to life on land. Chang has spent years studying fish and animal fossils in the sedimentary basins of China’s eastern coastal provinces. Her most important contributions to science have been her studies of the cranial anatomy of the earliest sarcopterygians (a type of lobe-finned fish) from more than 400 million years ago in eastern Yunnan Province. In 2016, Chang won the Romer-Simpson Medal, vertebrate paleontology’s highest honor. The extinct sarcopterygian fish Meemannia was named in her honor. But the paleontologist is not yet used to her overnight popularity among netizens. “[Their zeal] surprised me greatly. I just did my work, and didn’t do anything special, really,” Chang said quietly. Chang still invests most of her energy into fish fossil studies. “Retirement” is a foreign concept. Every morning she leaves home at 8:30am and arrives at the office by 9am. Holidays are her favorite time of the year, for when everyone else goes on vacation, she can enjoy a quiet time at the office tinkering among the ancient bones, undisturbed. “My journey in vertebrate paleontology research started 60 years ago,” Chang recalled in her acceptance speech. “At that time, I couldn’t choose my own career path. It was all planned [by the country]. The initial relationship between me and paleontology was very much like an ‘arranged marriage’– as the saying goes, ‘marry first, love later,’” she joked, drawing laughter from the audience. Born in 1936, Chang grew up in an intellectual family in Nanjing, Jiangsu Province. She developed an interest in science at a young age, inspired by her father, Zhang Zonghan, who was an outstanding professor in neurophysiology with a doctoral degree from Chicago University. Her father’s influence saw Chang dream of being a doctor. This changed when Chang was aged 17 and decided to become a geologist in order to “serve the country” in the same way as many of her peers. In the 1950s, right after New China was founded, the nation was in urgent need of geological talent. But Chang’s path changed once more in 1955 when she was in her first year of a geology degree at the China University of Geosciences in Beijing, when she was posted to Moscow University to study paleontology. “At that time, I had no idea what paleontology was about,” she said. Chang and dozens of her peers were sent to study different disciplines of science – including botany and zoology – to meet the needs of China’s scientific development. At the suggestion of the leading Chinese fish scientist Wu Jianwen, Chang began her lifelong journey in fish studies. The years in Moscow were a golden time for the young scholar. Chang and her peers collected petrified fish fossils on the riverbank in suburban Moscow; at night they boated on the Moscow River, casting a net and drawing it in at 5 or 6 o’clock in the morning. The crew compared the ancient fossils they collected with modern fish they caught to explore their relationship. “We kept some of the fish for research, but as for the rest of them, we made delicious fish soup. Quite yummy actually,” the scholar recalled with a mischievous smile. Chang returned to China, and began working at the IVPP in 1960. She began to “love” the ancient fossils during an early field project in Zhejiang Province. Chang spent three months each year accompanying geological survey teams to collect fossils in the field, a practice she maintained until the age of 80. The only female scientist in the team, Chang never got any special treatment during the outdoor scientific expeditions. She cut her hair short. She walked 20 kilometers a day, climbed hills and mountains with heavy equipment on her back, and slept on the ground in the wild. “Mosquitos, fleas, bugs and rats, those annoying things never gave us peace,” she recalled. But now, those tough years are the elderly scientist’s most precious memories. “We were young, always had fun together and never felt tired no matter how hard it seemed,” she told NewsChina. In 1965, Chang was transferred to the Swedish Museum of National History in Stockholm to study, but the training was short-lived as the Cultural Revolution (1966-1976), which broke out a year later, saw her summoned back to China. It was not until 1980, at the age of 44, that Chang made it back to Sweden to continue her doctoral studies at Stockholm University. In 1983, Chang became the first female head of the IVPP. As China’s most celebrated paleontologist, she played an instrumental role in reviving the country’s paleontological research, nurtured Chinese graduate students in paleontology, and assumed a pivotal role in fostering international collaborations. It was the decade in which China gradually woke from isolation and strove to cope with the drastic changes taking place around the world. The surge of new theories, cutting-edge technology and newly established interdisciplinary fields in Western biological research left many Chinese scholars at a loss. 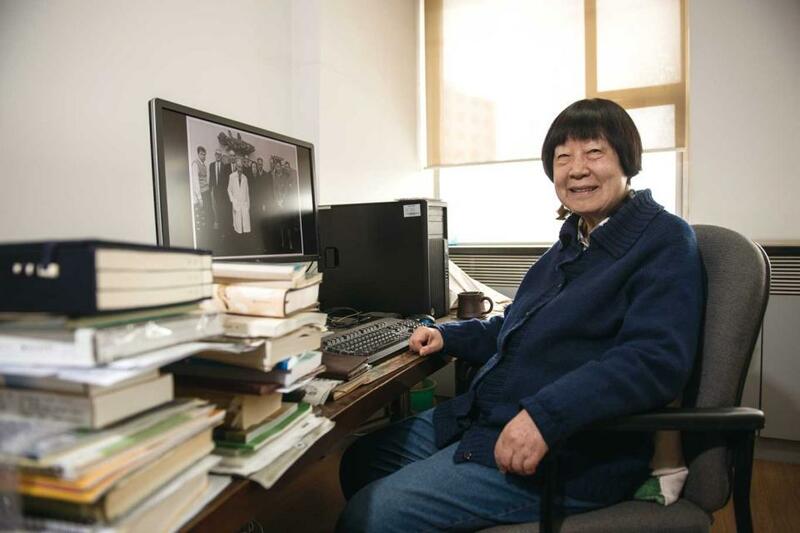 Along with other leading Chinese paleontologists like Zhou Ming-zhen and Yu Xiaobo, Chang spent years translating new academic papers, books and materials into Chinese, compiling them into two anthologies, laying the foundation for the development of modern Chinese paleontology. “Those translated works had a far-reaching influence at that time. Western theories, after being introduced to China, were immediately put to use to guide scientific research. And the academic gap caused by the Cultural Revolution was gradually filled by the scientists of our generation,” Zhu Min, then a student who helped Chang with translations and who is now a researcher at the IVPP, told NewsChina. The painting was a birthday gift Chang received from a student seven years ago. The fish, identified as “Young” in the picture, represents her most significant contribution to science – the study of Youngolepis. There is overwhelming scientific consensus that humans and other land-based vertebrates, or “tetrapods” (mammals, birds, reptiles and amphibians) are descended from fish. Our primitive aquatic ancestors experienced a comprehensive transformation of all body parts, including the respiratory system, to move from the ocean to land. Humans have four nostrils – the two exterior ones, as well as two internal ones known as “choanae.” They function together to enable us to breathe through the nose into the lungs. For decades, the question of how humans came to have such a structure was a mystery. It was the renowned 20th Century Swedish paleontologist Erik Jarvik who theorized that the porolepiforms, a prehistoric lobe-finned fish which lived in the Devonian Period (416m BCE-358m BCE), had three sets of nostrils: two external that were olfactory instead of respiratory, and one internal set for breathing on land. For years, this conclusion had been a mainstream view in international paleontology. In 1980, Chang visited the Swedish Museum of National History in Stockholm and learned from Jarvik. She spent two years studying the fossil of Youngolepis, a genus of the earliest sarcopterygians from the Early Devonian about 407-416 million years ago. The fossil was unearthed by Chang and her student Yu Xiaobo in Qujing city, in Southwest China’s Yunnan Province. Chang used the serial-section technique she had learned from Jarvik to investigate in exquisite detail the fine structure of the 2.8-centimeter cranium of the fossil. Over two years, she drew over 540 pictures and made thin wax plates. She created a three-dimensional scale model out of these wax plates, showing the internal structures clearly. A eureka moment occurred in the process of drawing and sectioning, as Chang discovered that the Youngolepis had no internal nostrils at all. Such a surprising finding led her to re-examine porolepiforms, which she found had no internal nostril either. “At first I couldn’t believe my eyes. How come it was different from what my teacher [Jarvik] said? Then I read books and rechecked it many times and was finally sure: It was indeed different. The discovery was a big thrill,” Chang told NewsChina. Chang’s discovery overturned the mainstream view and led to a decade-long debate on the characteristics of lobe-finned fish. In the early 1990s, Chang and her student, Zhu Min, unearthed the fossil of a small lobe-finned fish called Kenichthys, which dated from 395 million years ago in Qujing, Yunnan Province. Kenichthys is important to the study of the evolution of tetrapods because of its unique nostrils: they show the evolution of nasal passages at their midway point, with two nostrils in between the front teeth. The unique respiratory structure of Kenichthys provides vital evidence for the theory that while the two nostrils remain on the exterior, the other set slowly moved through the teeth and palette to become choanae. “Professor Chang’s forthright words and actions do offend some people,” says Miao Desui, one of Chang’s long-term academic partners who has co-authored more than 20 articles with her. “It is quite an understatement to describe her as a mild-tempered person.” Miao is the paleontology collections manager at the University of Kansas, and a research associate at the IVPP. In Miao’s eyes, Chang, whether as a leader or a researcher, is a person of ruthless directness who “sticks strictly to the principles.” “She hates academic misconduct in the scientific research community to the bone and never hesitates to lash out,” Miao said. Chang has been even busier since 2016 when she received the Romer-Simpson Medal. Her life is increasingly crammed with meetings, paper reviews, letter writing and seeing old friends. “Getting busy made me a bit anxious,” the scientist told NewsChina. “I would be extremely happy if I could have six or seven hours every day for research without being disturbed,” she said. Chang is currently researching the throats of cyprinid fish that lived during the more recent dinosaur age (known as the Mesozoic Era (252m BCE-66m BCE). In the mid-1990s, Chang handed over the fruitful study of fish fossils in the Devonian Period to Zhu Min and other younger scholars and turned her focus to Mesozoic fish studies. Unlike the Devonian, the Mesozoic Era is not a significant turning point in the course of life evolution, meaning Mesozoic fish fossils are usually deemed to have less potential to produce immediate and fruitful academic research. Chang has made efforts for two decades to research these “unwanted hard bones,” hoping that one day scientists of younger generations may discover something important based on her long-term accumulations. “I might not have the chance to see the result in my remaining days. But surely such work must be done,” she said. “I feel there are still too many things out there waiting for me to discover. I have no time to feel tired,” she said. Zhu Min understands how her mentor feels. “For scientists who research evolution like us, the life of a human being is nothing but a short episode in the entire process of animal evolution. Paleontology, as a branch of the basic sciences, might not have an immediate influence on human society as applied sciences do. But our work is to help people understand the history of the Earth, and make a contribution to completing human knowledge,” Zhu told NewsChina.